This toll free prefixes list is current and kept updated as new prefixes are released. 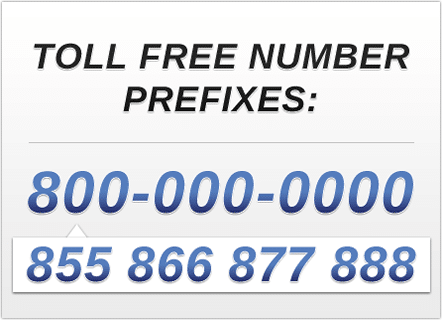 All toll free number prefixes (800, 888, 877, 866, 855, 844, 833, 822 etc.) are regulated and function the same way as the original 800 number prefix released in 1963. Although often referred to as prefixes, technically these 3-digit numbers are area codes as part of the North American Numbering Plan (NANP). However, unlike local dial zone area codes, toll free area codes are setup so callers do not pay long distance fees when calling over traditional landlines. They also give businesses a national presence since they do not represent a specific region in North America. Moreover, the FCC has put in special toll free number portability rules that protect business owners who use the numbers by ensuring that businesses can easily move their toll free number from one phone company to another without service interruption. That is why even today, toll free numbers are the preferred business phone numbers of small and large companies alike. You may get toll free numbers with all of the above listed toll free prefixes from FCC authorized toll free service providers such as UniTel Voice. 1. What are the current available toll free number prefixes? The following toll free prefixes are available: 800, 888, 877, 866, 855, and 844. The next prefix to be released is 833 which is tentatively scheduled to become available on a limited basis April 22, 2017. This is an important date to remember because your best chance of getting a great vanity toll free number is within the first few days of a new toll free prefix release. As availability frequently changes, UniTel Voice is here to help you find the best available toll free number for your business. 2. What is the difference between a toll free prefix and a toll free area code? For all intents and purposes, there is no difference. Technically the first 3 digits of a toll free number is not a prefix, it is the number’s area code, but in the telecom industry, it has become acceptable (because of common use) to refer to it as a prefix. 3. Who decides when a new toll free number prefix should be released? Based on consumer demand, the FCC in conjunction with the National Toll Free Number Database Registry, Somos (formerly known as SMS/800) determines when new prefixes should be released to fill a shortage in toll free numbers. Sumos manages the spare pool of toll free numbers and allows special phone companies called RespOrgs (responsible organizations) to provision numbers from the spare pool and provide consumers with toll free number service. Historically, new toll free prefixes have been released every 3-5 years. 4. What are the benefits of using a toll free area code? The ability to provide callers with a number they can call free of charge is less important today because of cell phones and VoIP calling. However, toll free numbers are still extremely popular for 4 reasons: 1), they give businesses a nationwide presence; 2), the give businesses instant credibility; 3), toll free vanity numbers can be easily remembered and branded; and 4), toll free numbers can easily be ported to any carrier at any time without service interruption. 5. What happens when all toll free prefixes are used up? 6. When will the FCC release the toll free prefix 833? The FCC is tentatively scheduled to release the newest toll free prefix 833 on April 22, 2017. This is subject to change. The most recent toll free number prefixes to be released were the 844 prefix in 2013 and the 855 toll free number prefix in 2010. 7. When will the toll free prefix 822 become available? There has been no date yet for the release of 822 numbers. However, historically new prefixes are released every 3-5 years, so it is reasonable to assume the earliest release date for 822 toll free numbers would be 2020. 8. Is 811 a toll free number prefix? The prefix 811 has not be reserved to be used as a toll free prefix. Certain areas of North America use 811 as a governmental information line similar to 411 or 911, therefore the area code 811 is not a toll free number will not be used as such. 9. What prefix comes after 822? After 822 toll free numbers are used up, the next set of area codes reserved for toll free number use are 887, 886, 885, 884, 883, and 881. 10. Can you pre-order and reserve a toll free prefix before it is released? Yes, shortly before a toll free prefix is released some phone companies may allow you to submit pre-order requests, giving you the best chance to be first in line to secure a great vanity number. New toll free numbers are distributed to RespOrgs (phone companies with special authorization like AT&T and UniTel Voice) in batches of 100 numbers per day on a first come, first serve bases before they become generally available to the public. 11. Can you still get a number with an 800 area code? Since 800 numbers were first released on the early 1960’s almost all of them have been snapped and are currently in use by businesses across North America. But the answer is yes, UniTel Voice has a large selection of true 800 numbers available for instant signup. You’ll also find that UniTel Voice has the best toll free number service for on-the-go entrepreneurs who run their business from their cell phone.